NDB opened its latest branch, offering a wide range of financial services and solutions to the people of Embilipitiya. The commitment to continuously expand NDB’s branch network across many cities and towns, is re-iterated with the opening of its 64th branch in Embilipitiya. Embilipitiya is a significant commercial hub progressing towards rapid economic development and integration. Banana cultivation is a prime source of income and the town is also recognised for the rich rice it provides for the country. Fostering a SME culture amongst its people, NDB provides the business community at Embilipitiya with the expertise and infrastructure that will support such endeavours. Commenting on the occasion CEO of NDB Russell de Mel stated, “The growing customer base continues to emphasize the importance of the increasing branch network that has become priority at NDB. Economic drivers have been recognized and custom built into all branch operations to capitalize on various activities within cities. NDB will also provide short term working capital loans, supplier and distributor financing and long term funding to the business community in the area. In addition to this, NDB will offer an array of commercial banking products and services such as Current and Savings Accounts, Children’s Savings Accounts with an exciting gift scheme, NRFC/RFC Accounts, Fixed Deposits, Housing Loans, Education Loans, Personal Loans, Leasing facilities, Credit Cards, Debit Cards, Pawning services , Western Union Money transfer services, Internet Banking and Bancassurrance. The Branch is located at Pallegama Embilipitiya. NDB remains dedicated to bringing its customers one-step closer to accomplishing their lifelong ambitions and uplifting their standards of living through the range of services that is accessible through its growing branch network. (Above) Ceylinco Life Family Savari winners in China. (Below) Ceylinco Life Managing Director/CEO R. Renganathan (right) and Director/Deputy CEO Thushara Ranasinghe with winners at Leisure World. 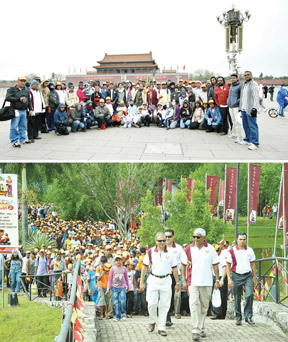 From walking on the Great Wall of China to plummeting down the water slides of Leisure World, policyholders of Ceylinco Life were treated to experiences of a lifetime when the 5th Family Savari of the life insurance market leader got underway in April 2012. The month began with 15 policyholders and their family members, a total of 60 people, flying to China for an all-expenses paid holiday in Beijing. Thereafter, another 2000 people representing 500 policyholders and their family members spent a day of thrills and spills at the theme park in Avissawella on the Friday following the New Year weekend. Another 50 policyholders and 150 family members will fly to Singapore for an all-expenses-paid holiday courtesy Ceylinco Life in May. In all, 2,260 people will benefit from the 5th edition of Ceylinco Life’s Family Savari programme, taking the total number of people rewarded since the inception of the promotion beyond 11,000. The promotion is intended to generate greater awareness of and interest in life insurance in market segments as yet unprotected through insurance, reward existing policyholders for keeping their policies active and to provide an incentive to others to revive and maintain their policies. The promotion runs from July to December each year, during which all active long term Ceylinco Life policyholders as well as holders of Ceylinco Life Retirement Accounts (CRAs) can earn multiple winning chances. Independently rated as one of Sri Lanka’s most valuable brands, Ceylinco Life has more than 850,000 lives covered by active policies and has been the market leader in Sri Lanka’s long term insurance sector for the past eight years. The company is acknowledged as the benchmark for innovation in the local insurance industry for its work in product research and development, customer service and professional development. A leading refrigeration, Air conditioning and Building Services company Frigi Engineering Services Pvt Ltd celebrated its 30th anniversary at Grand Orient Hotel recently. The company is a great foreign exchange earner by supplying its services to international companies such as Dunham Bush-USA,UK and Malaysia, Olympia Electronics Greece Atlanta Germany and King Sun Industries in Taiwan. The company also has diversified into real estate, trading and gem trade. The company has employed around 90 people at present. Seventeen of them received awards for their excellent performances at the 30th anniversary. In the picture the staff with the Chairman of the company Engineer Walter Perera. Commercial Bank Assistant General Manager Personal Banking Vimal Fernando accepting the first deposit from a customer at the Pelawatta Customer Service Point. The Commercial Bank of Ceylon has opened its 215th Service Point in Sri Lanka, at the LAUGFS Supermarket at Pelawatta. The new service point is open for business from 10.00 am to 7.30 pm. It is equipped with an Automated Teller Machine that is linked the Bank’s network of 512 ATMs and 214 other service points. Commercial Bank is the largest private bank in Sri Lanka, and the only Sri Lankan Bank listed in the world’s Top 1,000 Banks. The Bank has been adjudged ‘Best Bank in Sri Lanka’ for 14 consecutive years by ‘Global Finance’ Magazine and has won multiple awards as the country’s best bank from ‘The Banker,’ ‘FinanceAsia,’ ‘Euromoney’ and ‘Trade Finance’ magazines. 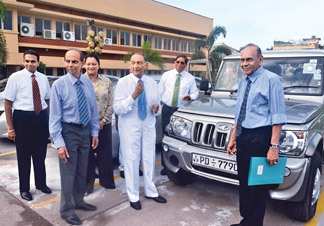 Maliban Biscuit Manufactories (Pvt) Ltd recently donated a vehicle to The Ceylon Association for the Prevention of Tuberculosis (CNAPT). The event was attended by Chairman, A. G. R. Samaraweera and other directors of Maliban Biscuit Manufactories (Pvt) Ltd with Fonseka, Secretary General of The Ceylon Association for the Prevention of Tuberculosis representing the organization. Boasting a history of over six decades, CNAPT has worked relentlessly throughout the years to eradicate the dreaded disease of Tuberculosis. Since its inception at a time when tuberculosis was rampant in the country, the work carried out by CNAPT has been able to provide much needed assistance to the people suffering from the disease. Building children’s wards in hospitals, establishing provincial clinics and branches outside of Colombo to reach the general public, establishing rehabilitation centers, conducting home visits and conduction of The National School Health Programme are some of the projects undertaken and completed by the CNAPT in the past decades. This new vehicle will be a beneficial addition to CNAPT in order to carry out the respective projects more efficiently. Furthermore, the donation of the vehicle is another inclusion to the impressive list of community services carried out by Maliban Biscuit Manufactories (Pvt) Ltd. Equipped with ISO 9001, ISO 14001, ISO 22001 and many other international and national awards, Maliban Biscuit Manufactories (Pvt) Ltd is always willing to lend a helping hand to worthy causes throughout the island. Mahesh Nanayakkara Managing Director/CEO and Sasindra Munasinghe Executive Director/Chief Credit Officer jointly cuts the ribbon at the inauguration of CDB’s Kandana Branch. Citizens Development Business Finance PLC. (CDB) recently spread its wings to Eheliyagoda, Kandana, Marawila and Ragama thus taking its product offering to a greater public and parallely consolidating its island wide presence. Fully geared to extend CDB’s wide range of products and services to the people of these areas, the new outlets are conveniently located in each of the four bustling towns, thus facilitating easier and faster accessibility with ample parking space. 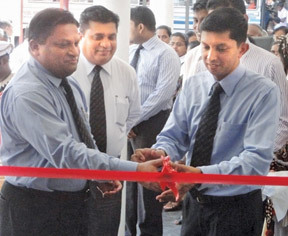 The Eheliyagoda Branch was declared open by CDB’s Executive Director/Chief Marketing and Sales Officer Malcom Weerasuriyaat, while the Ragama Service Centre located at Kadawatha, Ragama was inaugurated by Executive Director/Chief Operations Officer Roshan Abeygoonewardena. 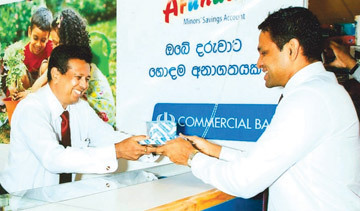 Meanwhile operations at the Kandana Branch and the Marawila Branch were launched by CDB’s Executive Director/Chief Credit Officer Sasindra Munasinghe. These new outlets were opened in the presence of a representative gathering of customers and the local community of the respective areas. Totally modernised and with a spanking new interior décor, the outlets personify CDB’s client-friendly approach in servicing customers. With these new online-connected outlets, CDB now brings its island wide reach across Sri Lanka to 39. The brand CDB ranks 50th from among the Top 100 Most Valuable Leading Brands in Sri Lanka by Brand Finance Lanka in 2012. South Korea's financial watchdog on Sunday suspended four savings banks because they failed to meet financial-strength standards, after one bank boss was caught trying to flee to China. The four ordered to halt their operations for six months are Solomon, Mirae, Hanju and Korea Savings Bank, the Financial Services Commission said, amid moves to tighten the banking industry in South Korea. “All operations of the savings banks including Internet banking were suspended from 6:00am today,” the regulator said in a statement. They were told to appoint new managers and improve their finances within 45 days. They will be put on sale if they fail to do so. Depositors would be allowed to get back up to 50 million won ($44,000) to avoid a run, the commission said. It promised to investigate any irregularities by major shareholders and executives of the banks. They were ordered to stay in South Korea for questioning. Mirae chairman Kim Chan-Kyong was arrested late Thursday while trying to sneak out of the country at a port in the southwestern city of Hwaseong, prosecutors said. Sri Lanka’s first-ever interior paint with Teflon® Surface Protector has been launched in the country by the India-headquartered coatings giant Asian Paints, setting a new benchmark in stain-resistance and durability for interior paints in the local market. 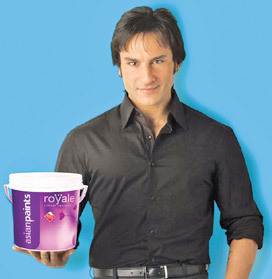 Asian Paints’ ‘Royale’ branded Luxury Emulsion paint now contains Teflon® patented by the multinational DuPont, offering users significant value additions, the company said. The Teflon® Surface Protector significantly enhances the ease of cleaning and maintaining ‘Royale’ Luxury Emulsion wall finishes, as it ensures the safety of the film of paint while scrubbing. In addition, the Teflon® Surface Protector acts as a barrier to stains and combined with the natural strength of the ‘Royale’ Luxury Emulsion coating, enables a film of paint to withstand a high amount of pressure. The Teflon® Surface Protector used with ‘Royale’ Luxury Emulsion is tested and approved in the USA by the R & D teams of DuPont. A widely used high-performance engineering additive, Teflon® is best known for its applications in non-stick cookware and automobiles, but is also used in a wide range of other products including eyeglasses, apparel, electric appliances, carpets and hair dryers. Among the other pioneering initiatives of Asian Paints in the local market was the introduction of the sophisticated Colour World computerized tinting and dispensing units that enable customers to do experimental painting on the exteriors and interiors of their own homes, before the purchase of paint. Asian Paints was also the first paint manufacturer in Sri Lanka to be awarded the Sri Lanka Standard (SLS) certification for paints dispensed via Dealer Tinting Systems. In addition, Asian Paints was the first company in Sri Lanka to introduce a high performance exterior emulsion with a seven year warranty with the launch of ‘Weathertuff Ultima.’ The company also launched a new-concept paint retail outlet that focuses on colour as an idea rather than a product. The first such ‘Colour Ideas’ store was opened at the Siyane Arcade, Ampara by the company. Asian Paints was also the pioneer in the introduction of a wall putty formulated specifically for exterior walls to the local market. All Asian Paints products are guaranteed not to contain any added Lead, Mercury, Arsenic or Chromium. Asian Paints Lanka was the first overseas acquisition of Asian Paints, one of India’s most respected multinationals with international operations in 22 countries. It manufactures and markets an extensive range of paints including Asian Paints ‘Royale,’ ‘Classique’ and ‘Premium’ Interior Emulsion, Royale Play and Royale Play Matallics, APEX ULTIMA Weather Proof Exterior Emulsion, APEX Weather Proof Exterior Emulsion, ACE Exterior Emulsion, ‘Decora’ Economy Emulsion & Enamels, varnish, wood finishes, enamels, thinners, industrial paints, clear lacquers, AP Kote Wall Putty and Exterior fillers. Speed Water Systems opened its newest distribution centre in Rajagiriya recently. Speed Water Systems, a leading Sri Lankan company which produces purified bottled drinking water on par with international standards, is continuing to open distribution centre in all key towns in Sri Lanka under the company’s inspiring slogan “To make purified water more affordable and available to all’’. It was under this initiative that the latest addition to the sales network was launched at Rajagiriya. Speed Water Systems Managing Director, Nishantha Delgoda, and Rohan Nugawela, Manager, opening the newest Speed Water distribution centre at Rajagiriya recently. Nalin Delgoda, Chairman, Speed Water Systems, is also in the picture. Commenting on the opening of the newest distribution centre, Nishantha Delgoda, Managing Director, Speed Water Systems (Pvt) Limited said, “The Kotte area, where Sri Lanka’s Parliamentary Complex is location, has witnessed tremendous development. Wide multi-lane highways, tourist hotels and holiday homes, entertainment parks, playgrounds and multi-storied apartment complexes are being built”. “As a result of this rapid development, Rajagiriya has transformed into a populous sub city outside the metropolis with many branches of local and foreign banks, supermarkets, mauls and key commercial establishments doing brisk business. The Speed Water distribution centre was opened at Rajagiriya in line with this continuing positive development trend”, he said. The establishment of ‘Speed Water Shops’ island-wide and their operations are handled by Mr. Gihan Moraes, Senior Sales Manager and Ritzy de Silva, Business Development Manager. 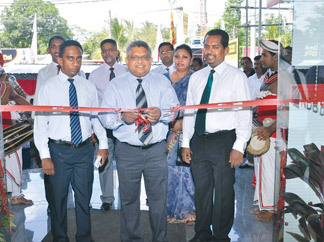 Expressing his views, Ritzy de Silva said the newly opened Speed Water distribution centre at Rajagiriya will also adhere to the three marketing strategies incorporated into the key concept adopted by Speed Water Systems Limited. This means that purified bottled drinking water will be sold under the one roof at retail prices to consumers, wholesale prices to traders and on a delivery basis to business establishments and industries as per their requirements. During the April Holidays Travelon ventured out to Ho Chi Minh (Saigon) City with 14 adventurous Sri Lankans led by their tour captain, Director Bandula De Silva. Travelon has already completed tours to Myanmar, Egypt, Kenya, Bhutan, Northern Thailand, Philippines, Singapore, Malaysia, Laos, Indonesia and adding Vietnam as their 10th destination. An evening City tour to visit the famous Notre Dame Cathedral and the Post Office built during French era and still functioning with past efficiency and glory. The group became instant Millionaires when they exchanged $ 100 which gave them 2.1 Million Vietnamese Dong (1 US$ = 21,000 Viet. Dong). The first dinner in HCMC was at an elegant up-market authentic Vietnamese Restaurant in the Old Qartier (Old Town) which the group appreciated very much. The night's dinner was on a luxury Cruise ship along the Saigon River with international food & serene Vietnamese music (all instruments made locally in Vietnam and played by lovely young ladies in the traditional AO DAI dress). Early next morning the group left by air to Danang (Vietnam Airlines) and on arrival visited the Champa Museum and Marble Museum. Thereafter a visit to Hoi An and discover the historic architecture with Chinese-style shop houses and Japanese covered Bridge. Dinner was at an old style building with Colonial charm. Overnight was at Hoi An Resort with up-market frills & trimmings. Next morning saw the group travelling via the Hai-van pass which is a picturesque high mountain range which divides the Danang province and Hue. In Hue the group explored the Imperial Citadel and Khai Dinh's tomb. (resembles terracotta warriors of Xian) The highlights of the Hanoi visit was the water puppet show, Ho Chi Minh's Mausoleum (where Father Ho's body is kept in a 16øC display room for 9 months - from December to August each year, the rest of the year he's remains are stored in Russia to be treated with special chemicals), One Pillar Pagoda, & fine arts museum. The most important site visit in Vietnam is considered as the Halong Bay excursion. (Halong Bay is considered the 2nd most important natural wonder of the world). One must stay a night in a Junk Boat (in this case a luxury boat with 10 cabins) to get the true feeling of the Bay. Millions of years ago rock formations from the bottom of the sea resulted in 1969 craggy limestone cliffs emerging from the emerald waters. In short, if you haven't visited Halong Bay, you haven’ t seen Vietnam. Travelon's next tour to Vietnam is scheduled for December’ 2012.